We like a little bit of bike-riding here in the office. Road bikes, mountain bikes, BMX’s, little shoppers with a basket on the front, whatever your ride, it’s all good with us! So we’re pretty excited that the 102nd Tour De France starts in Utrecht this weekend (Sat 4th July). Anyway, being designers we do like a nice infographic! It’s great when we can combine our passion for cycling with a good bit of design. 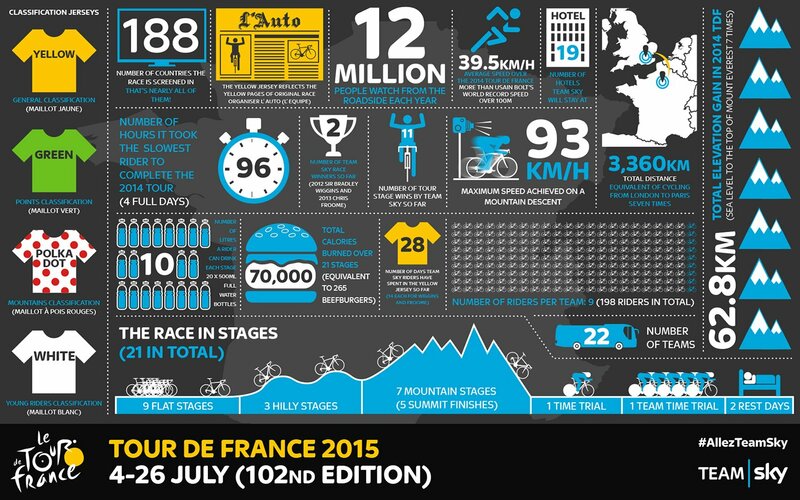 We love the infographics Britain’s Team Sky have been creating before the big races this year. Here’s their latest one for the Tour… Anyone fancy riding 3,360 Km in 22 days? !